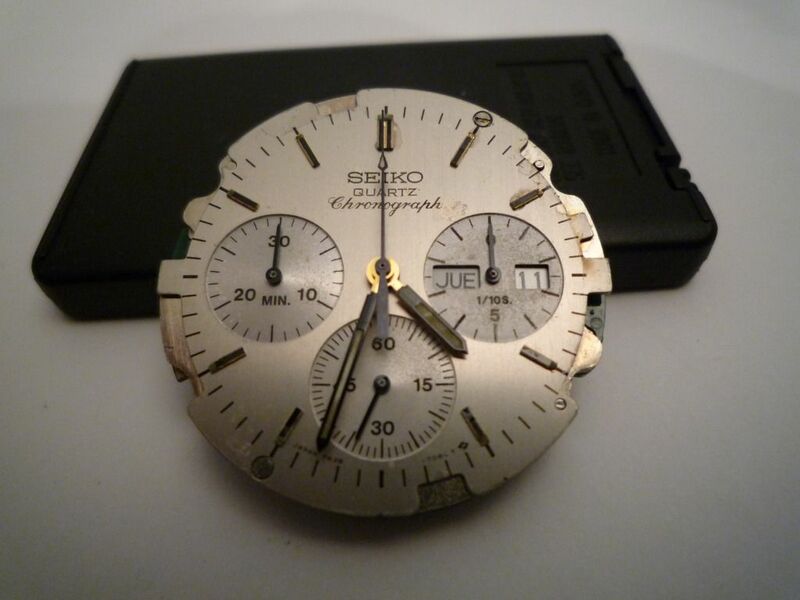 Forum Home > Bend it, Mend it - Mods & Wreckers > The WatchUseek Restoration Challenge Game thread... continued - A FREE 7A38 ! In the past I've been (and still am) a member of many other watch forums, worldwide. I still post on some of them when time allows. One of them, naturally is WatchUseek - the world's largest watch forum. In fact, I've made a few odd posts on there fairly recently. One post, which I made at the weekend was deliberately tongue in cheek and prompted a PM from the person I'd responded to. 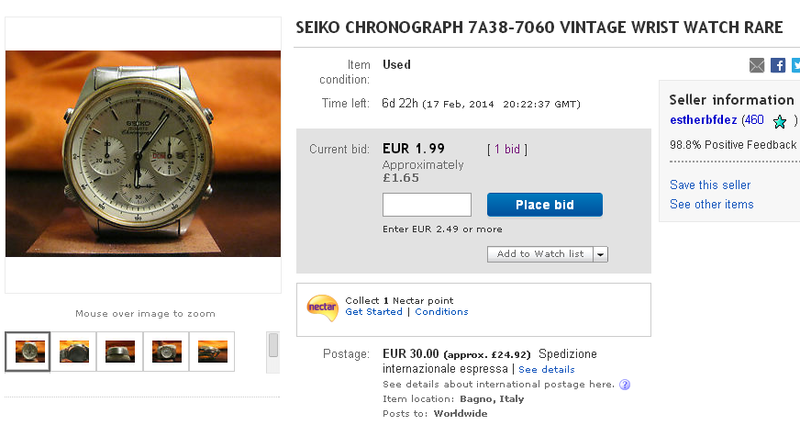 My post read simply: Correct - in a matter of fact way, perhaps, Ray - but there's plenty of online support for Seiko 7Axx's elsewhere. I was of course referring to this forum. I'm sure Ray won't mind me copying and pasting part of his first PM - it'll help explain the story. The rest I'll paraphrase and précis. If you're in the US and interested, I'd love to send it to you and see how much you'd want to repair it. If it needs too much or you don't want to repair it you'd be more than welcome to just keep as it deserves better than sitting in the dead section of my watch cabinet. But after I'd done that, I had a thought. Knowing Spencer is trying to make a living, he would charge accordingly. Note the model in the title of Ray's PM: 7A38-7000. Maybe fine investing some money on a stainless 7A38-7000, but what if it happened to be a gold-tone ? He could end up spending more with Spencer, in parts and servicing costs, than the watch was worth. So I asked the question. Ray replied that it was a two-tone. Of course there's no such thing as a two-tone 7A38-7000, so I asked if he could send me a photo of the watch on offer. To cut a long story short, turns out that it's actually a 7A38-7069 (fitted with the wrong case-back off a 7A38-7000). Now I wouldn't say that I've got a photographic memory, but I have a very good memory for photographs ! Okay no comments on using a H556-5029 as a project watch, so how about a 7A38-7000? I dug through my dead watch box and found it last night. This watch doesn't run. I put a fresh battery in it and can see the seconds counter trying to move. Chronograph functions perfectly. My guess is it needs a service. I've looked at the service manual and the movement seems pretty simple. Is it simple enough for someone who has never worked on a movement to service (clean and lubricate)? Oooh..I don't think so. I've rebuilt many of those and they are not for the novice to attempt. That's a 15 jewel 98% mechanical movement and the gears & pivots are tiny. These are a bit too complicated the main plate has seven pivots to align and are very delicate. Sorry. Consider the watch a donation to your forum and run a contest or do whatever you want to figure out who should get it. Feel free to use the pics if you want. Let me know who is supposed to get the watch and where I need to send it. I'll include the user manual and warranty card. The way the band is now, it will only fit someone with a 7 1/8" wrist or so. I'll look and see if I can find some extra links for it. Given that I found the manual and warranty card my guess is I have some extra links somewhere. Ray and I have traded numerous other PM's since. The upshot is that he is no longer stipulating that it goes to an enthusiastic potential repairer / new owner in the USA. He's prepared to mail it Worldwide (using basic USPS First Class International - without additional insurance or tracking), but expects the recipient to share the cost of the postage. Personally If it was me, I'd pay all of it. 1) This watch should go to an existing contributing forum member - one who already has 20 or more posts up the forum. 2) The person should be capable of fully completing the overhaul - not just taking the thing apart and leaving it in lots of pieces. 3) Once the watch is fully functional, should they decide not to keep it, Ray should be given first option (before putting it on eBay). 4) That whoever takes it on continues this thread with a fully documented account of their re-build efforts including plenty of photos. 5) That the rebuild is completed by 28th December 2014 - the 5th anniversary of the date of the last post in the Watchuseek thread. A functional overhaul with a new glass or a complete one with new dial and hands and parts to get a like NOS one ?? Now this is interesting, and I volunteer, of course. I am not the most expert, but surely I have done a lot of tinkering with the 7Axx and 7Txx, and I have some spare parts here... but in the end, I'd like to keep it, of course. That's assuming my assessment of it in this thread, based on the eBay seller's photos, is correct, Don. Besides, being a hotch-potch, that won't yield the correct case-back needed for the WUS project watch - it's a stainless 7A38-7060. Personally I think it ought to be rebuilt with the existing water-damaged? dial. It's a mark of its heritage. A bit like my 7A38-7000 project. I also think it should be kept as original as possible: case, dial, hands and band (the latter only if in wearable condition...) should stay. While I'd replace the glass, for obvious reasons, I would not swap the movement if not too damaged, but only replace the parts that are damaged with good working parts. It all depends on the real condition of the watch, without having it in front it's quite difficult to assess its condition from a couple of pictures. an used original crystal with only a few light scratches should be used. That provide the authentic look with a little bit wabi. Looks like a project for George - He did already the mainbridge video documentation. Treat the watch as if it came off the street and into a watch repair shop. Treated as a family heirloom--lightly cleaned serviced and working properly. ? With a better used crystal--But maybe that scrape was when grandpa fell out of the fishing boat. After a short wait, this morning I received the package from Ray with the watch. Had a lot to do today, so I am only now uploading the pictures I took this evening. Please be patient. 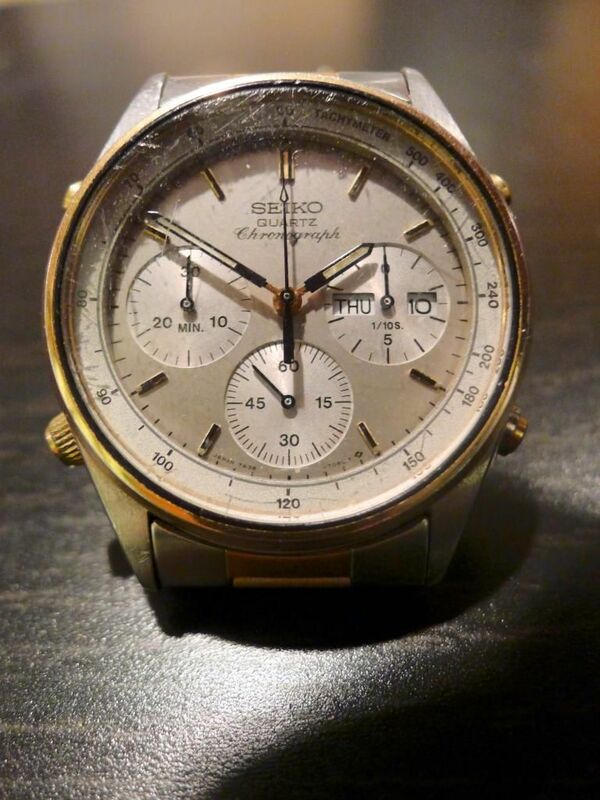 As for the watch per se, it's not in such bad condition as the pictures posted above might suggest. It does have a rust problem though, even if not that much, and probably the time / seconds hand step rotor will need to be replaced, since one tip is rusty and probably broken. Will update with pictures as soon as they are online. There are some scratches and dents on the glass, but nothing really "dramatic". I will eventually replace it when all the rest is done. 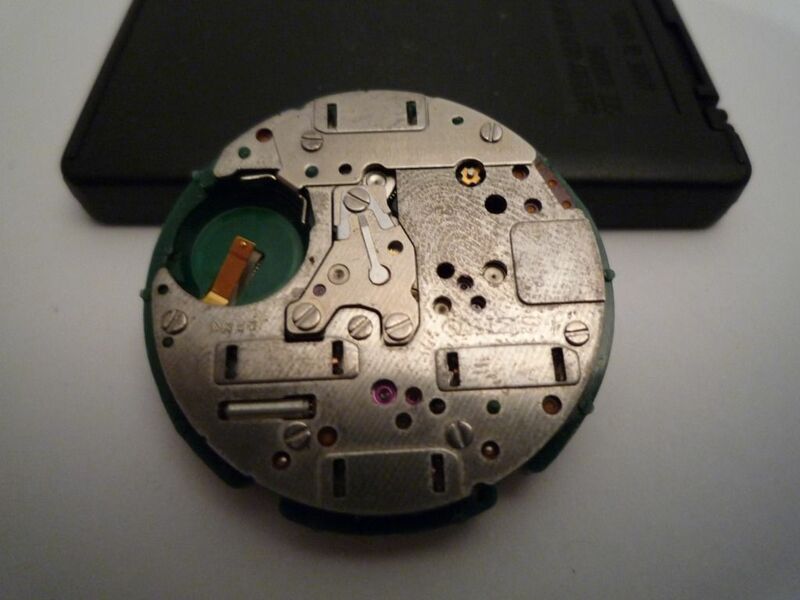 Once I removed the movement from the case, the dial showed all its defects and flaws: the border is starting to flake in some places, and there is moisture damage on the smaller dials, as well as on the main dial surface. Damage is not so bad, though, so I am considering eventually to replace it, if I find one in pristine condition. The day / date mechanism is unaffected by rust, fortunately, and only presents the classical debris whch can be easily removed with a proper cleansing and some rodico.